36+ Beautifully Crafted App Icons for your Inspiration! An icon is the foremost thing that one sees before downloading or opening any app. The app icon reflects the purpose of the app and moreover it is one of the most important object of any product. The Application icon can force an user to get curious enough to browse through the app. Various OS platforms and varieties of Icon guidelines ultimately create a vast number of creative opportunities for designers all over the world. In this article, we bring you some of the most beautifully crafted app icon designs for iOS platform by various designers with their unique creative ideas. An icon that can be mistaken for a real pancake. The texture of the cake & the light glare over the jelly adds to the realistic effect. Another delightful food icon with detailed textures and light effects. The three dimensional effects on the craters and the light over the top surface makes the icon pop out as a real moon. This one must be a favorite for all. The designer has put all efforts in preparing the bunny. It almost looks real ! Here, the ball texture is so detailed that it looks as if a real tennis ball has been compressed into this shape. A clean and soothing app icon that matches well with the product theme. Who ever thought that a backpack could be formed into an icon. This one gives a realistic effect of a dent inside the orange. Moreover the inner natural texture of the fruit adds to the beauty. A beautifully prepared textured book with much paid attention to pages and cover binding metals. Have a look at the glove detail ; from stitches to folds. The lens and glare sums it up all. A delight for the eye ! I loved the handle shadow and the clever shape of the cup formed into an icon. This one makes clever use of the screen lights and reflections. Another personal favorite of mine. The pleasantly crafted colors and textures says it all ! This icon is a bit different from the previous ones. It uses flat style combined with photorealism. The main attraction here is the natural wood feel with appropriate shadows. This one is a bit different from the previous orange icon. Beautifully designed. Looking at the right side of the icon, the minute details makes this look almost original. The designer has payed attention to metal grunge effects over the lens even. A mini mixer table. The icon says it all about the app and its purpose. The beauty of this icon lies in the top glass cover and the shine. The inner food items adds to the color theme and beauty of the icon. Just have a look at this delightful android app icon. With bright red, yellow, silver placed on an equally bright yellowish-orange backdrop would still your heart and you will be compelled to possess it. The greatest beauty of this ios ui inspiration lies in the bold choice and use of colours. The small container with golden lid and holding passionate scarlet magic potion creating an upheaval is worth a look. If you are a foodie, then this ios icon is bound to make you fall for it. The sumptuous piece of grilled chicken with glossy effect placed on cabbage leaf is a visual treat itself. This is an awesome material design icon that has a cushion shaped wooden box wherein lies a round shaped half zipped treasure filled with gold coins. The actual beauty of this icon lies in its bright and glossy colour shade. Who doesn’t like a cinnamon roll? We all do and with this spectacular golden brown cinnamon roll icon with sprinkled icing is bound to make you crave for a cinnamon roll and munch it right away. This ios gallery for android is a wonderful creation of a graphic artist’s thoughtfulness and artistry. The soldier’s head gear and blue eye shades adds to the beauty and glamour of this funny icon. This iPhone app icon gallery has a three dimensional effect with a crystal clear cube that has bright red fluid that fills it up. You can use it anywhere with little scaling and customisation to suit your specific needs. This app design inspiration 2015 is a beautiful icon that manifests a part of the leopard’s face but the real beauty of the icon lies in the animal’s eyes where a premium camera lens is fitted to make the design all the more enthralling. 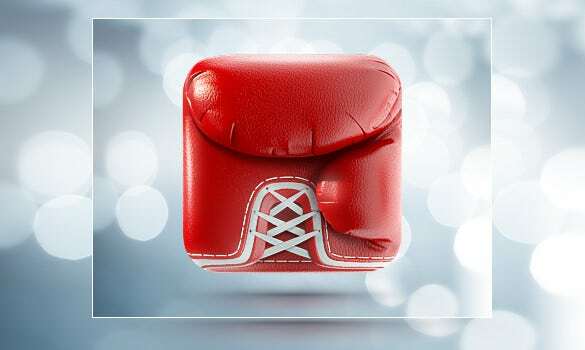 When you are looking for an android app icon that can be used for sports purposes, then you may have a look at this icon. It showcases a square shaped football with a Nike logo placed just at the middle of the ball. This is yet another sports ios icon crafted in silver outlines and placed on a netted black backdrop. The colour combination and flawless brightness of the logo can be regarded as the key behind its success. This is one of the best ios ui inspiration icon with a square shaped baseball having flawless stitches. The minute details of this design adds to the glamour and beauty of the intricately beautiful baseball icon. This is yet another exquisitely beautiful ios icon that can be used for a variety of usage. The glossy golden appearance of the coffee maker with two pristine white cups placed beneath the taps is a great sight to look at. We all love berries and cherries. Have you noticed the gloss on the skin of the cherries? That is what’s reflected in this material design icon with a boxful of cherries, above which two spoons are placed crossing each other. This is the best ios app icon in which a wooden box is divided into four parts and each of them is holding a white coloured dice and you can see three surfaces of each dice distinctly. Just have a look at how beautiful it looks. This is yet another square shaped icon with tapered ends on which a green tree is placed. The white box with the green tree is an amazing colour scheme and just by viewing it, you will be tempted and wish to possess it.